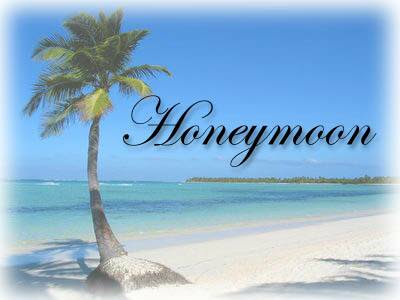 Unfortunately, circumstances did not allow my husband and me to take a honeymoon trip after our lovely wedding. We were young and poor. Luckily for us, it really was not a time when fancy honeymoons were taken by many. So, it really was not a big deal. Times have really changed since the earlier days. Earlier in history the groom would steal his bride away to a secrete place. This was done so that family and friends could not find them. What a great way to have some alone time together, right? While the newlyweds were in hiding they would drink mead; a wine made from honey. Their intention was to make their relationship more romantic and to grow their love. The honeymoon would last the length of one moon phase. This is how the word "Honeymoon" was born. The current day honeymoon does not typically last as long. Most couples still spend time together, celebrating being newlyweds. It could be as simple as a stay vacation, or a more elegant vacation like going to a fancy resort or cruise. There are so many options today and a variation in prices. It is just a matter of what your interests are and how much you can afford. Maybe I will get to go on my "Honeymoon" for my 30th anniversary? I guess time will tell....It is just around the corner... Wish me luck! !